MIAMI, Fla. — A Miami man was arrested on Sunday after he allegedly pulled a knife on a pastor and another man, and threatened to kill them both. According to reports, Juan Garcia and Daniel Pineda were standing outside of their Flagler Street church, the name of which has not been provided, when they were approached by Ramon Felipe, 30, who appeared to be intoxicated. Garcia then reportedly told Felipe that “being drunk or high is not the way of God,” and Pineda offered to pray for him. After the men prayed, Felipe entered the church, but Garcia and Pineda allegedly advised that the building was not open at the time and asked him to come back later. “I’m not going anywhere,” Felipe responded, according to NBC Miami, and proceeded to pull the door off the frame. Garcia and Pineda consequently sought refuge in Pineda’s car and locked the doors. Felipe is accused of following them and pounding on the window to try to break it. He fled on foot soon after. Police were able to locate Felipe, who was arrested and charged with burglary, aggravated assault at a religious institution and criminal mischief in a place of worship. He is being held on $20,500 bond. View a video of the court proceedings here. As previously reported, just last month, a California man pleaded guilty to murder after he killed a pastor with a drywall saw blade moments after the minister stepped outside of his home to pray with him. 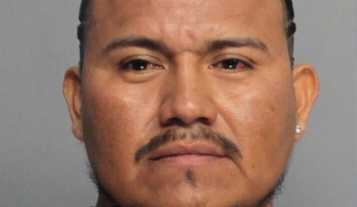 “Within minutes, while [Herbert Valero] was mid-sentence stating he was [Servando Silva’s] friend and that he could help, Silva stabbed the pastor in the neck with a drywall saw blade,” prosecutors said in a press release. Silva fled the scene and Valero ran into his house, where he told his wife and daughter that Silva had stabbed him. Valero’s family called 911, but he died in his wife’s arms before emergency responders arrived. He was pronounced dead after CPR was unsuccessful. Valero, a father of six, was known for working with the addicted and those involved in street life. Silva will be sentenced to 38 years to life on April 20.